"I wos a thinking," said Mr. Samuel Wilkins, during a pause in the conversation — "I wos a thinking of taking J'mima to the Eagle to-night." — "O my!" exclaimed Mrs. Ivins. "Lor! how nice!" said the youngest Miss Ivins. "Well, I declare!’ added the youngest Miss Ivins but one. "Tell J'mima to put on her white muslin, Tilly," screamed Mrs. Ivins, with motherly anxiety; and down came J’mima herself soon afterwards in a white muslin gown carefully hooked and eyed, a little red shawl, plentifully pinned, a white straw bonnet trimmed with red ribbons, a small necklace, a large pair of bracelets, Denmark satin shoes, and open-worked stockings; white cotton gloves on her fingers, and a cambric pocket-handkerchief, carefully folded up, in her hand — all quite genteel and ladylike. And away went Miss J'mima Ivins and Mr. Samuel Wilkins, and a dress-cane, with a gilt knob at the top, to the admiration and envy of the street in general, and to the high gratification of Mrs. Ivins, and the two youngest Miss Ivinses in particular. They had no sooner turned into the Pancras Road, than who should Miss J'mima Ivins stumble upon, by the most fortunate accident in the world, but a young lady as she knew, with her young man! — And it is so strange how things do turn out sometimes — they were actually going to the Eagle too. 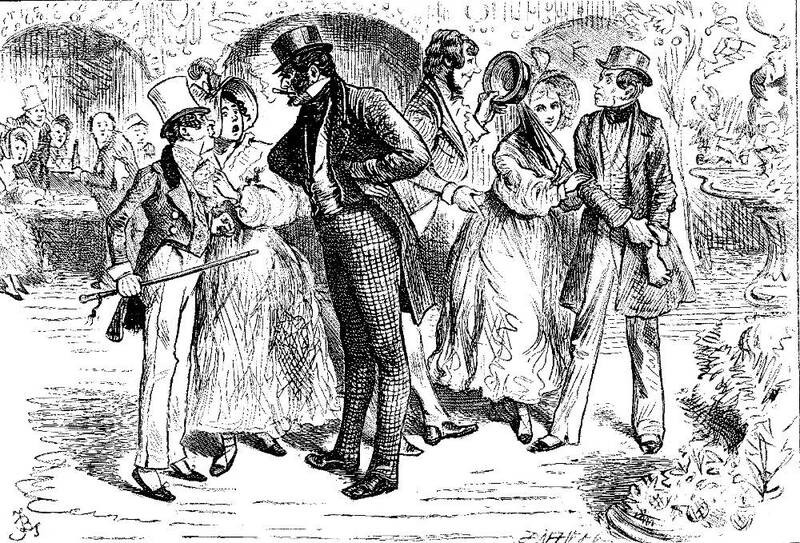 So Mr. Samuel Wilkins was introduced to Miss J'mima Ivins's friend's young man, and they all walked on together, talking, and laughing, and joking away like anything; and when they got as far as Pentonville, Miss Ivins's friend's young man would have the ladies go into the Crown, to taste some shrub, which, after a great blushing and giggling, and hiding of faces in elaborate pocket-handkerchiefs, they consented to do. Having tasted it once, they were easily prevailed upon to taste it again; and they sat out in the garden tasting shrub, and looking at the Busses alternately, till it was just the proper time to go to the Eagle; and then they resumed their journey, and walked very fast, for fear they should lose the beginning of the concert in the Rotunda. — "Characters," Chapter 4, "Miss Evans and The Eagle," p. 171-172. Even before Boz won greater fame as the author of Pickwick, in the summer of 1836, Macrone had proposed a second series of Sketches by Boz. Dickens was willing, and Cruikshank readily consented to illustrate the intended two volumes. He apparently agreed to select the subjects for illustration with the author, instead of independently as before, when the pieces as when the pieces were already published, and even retained the finished portion of the manuscript in order to follow the text more precisely. — Jane Rabb Cohen, "George Cruikshank," p. 17. "Miss Evans and The Eagle" was first published as a separate short narrative sketch in Bell's Life in London, 4 October 1835, over a year before Cruikshank and Dickens reached a compromise in the struggle for control of the subject-matter of the illustrations in the Second Series. Fiercely independent about his work, Cruikshank himself in all likelihood selected the scenes for illustration in the First Series, which included "Miss Evans and The Eagle." Eagle, the (dem. ), famous tavern and pleasure garden in the City Road, east London, a popular resort of the lower middle-class. The rotunda, where the concerta were held, was demolished in 1901 after being turned into the Grecian Theatre. Inside the gardens were 'beautifully gravelled and planted' walks with a 'place for dancing', 'variegated lamps', 'a Moorish band . . . and an opposition military band'. — The Dickens Index, p. 84. In and out the Eagle." — "Notable Pubs #1: The Eagle Tavern, London." If the point of an illustration is not merely to introduce the sketch, but to flag a key moment within a periodical text or part-issue, then Miss Jemima Evans is a failure, whereas Barnard's realisation of the confrontation between Whiskers and Wilkins at The Eagle is successful in that it sets up the reader's sense of anticipation — or would, if it were positioned properly, within the sketch, rather than two pages afterward, creating an analeptic reading. 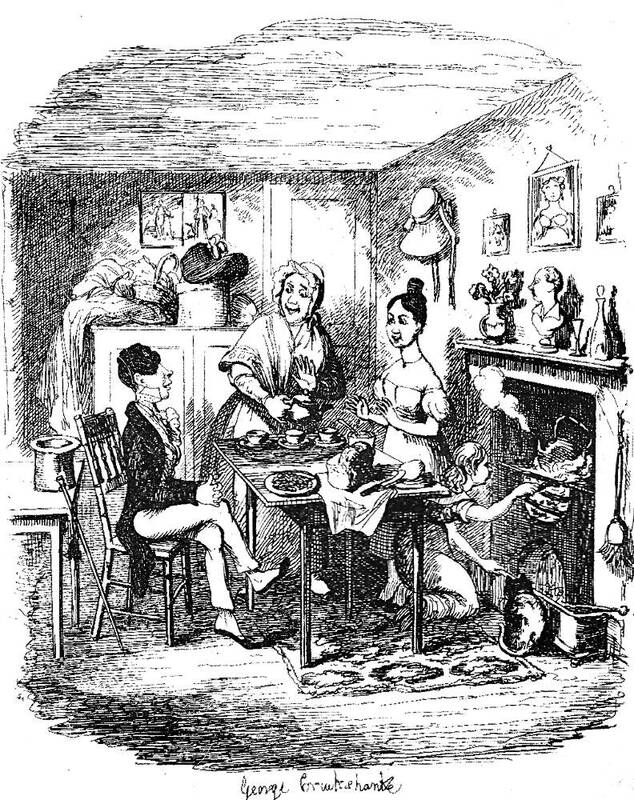 However, although young Charles Dickens and veteran illustrator George Cruikshank were jointly responsible for the selection of material to be illustrated in the Macrone second series of Sketches by Boz ("cuts by Cruikshank" Dickens originally proposed to John Macrone as a possible subtitle, advertising the well-known graphic artist's visual authorship), we must assume that the static scene of the Evanses and Samuel Wilkins at tea in the humble parlour does not necessarily represent authorial intention: it sets the scene and introduces two of the principal characters, as well as an important property (the gilt-headed cane of Samuel Wilkins, just behind him), but does not give the reader any sense of what is to come. Later, Dickens commended American illustrator Sol Eytinge, Junior from refraining from trying to usurp the function of the author as Eytinge described key characters, usually in pairs, but in The Diamond Edition (1867) did not attempt to realise moments of tension or conflict within the chapter. Whether this notion about the function of illustration was consistent across Dickens's career, however, is debatable as in his next work, The Adventures of Oliver Twist; or, The Parish Boy's Progress in Bentley's Miscellany each illustration does not merely introduce characters and settings, but also depicts significant characters in action, whether it be Oliver trouncing his fellow apprentice in Oliver plucks up a Spirit in the first movement of the story or Sikes's preparing to elude the minions of the law in The Last Chance; however, Dickens may well have had different ideas about the function of illustration in a serial novel as opposed to an essay, article, short story, or sketch. The illustration is not technically a "realisation" of a moment in the text, since one of the sisters is not shown (the other is tending the fire), so that we are not presented with "harmonious quartet" (171) that Dickens describes as at that point Jemima is upstairs, changing. Rather, in the illustration Jemima herself has descended, but has yet to don the white straw bonnet hanging on the wall behind her. Cruikshank seems determined to flesh out Dickens's parlour scene by filling it with realia that the young author has not even mentioned, including pictures above the fireplace, flowers, a portrait bust, and a decanter on the mantlepiece , and a large loaf, uncut, on the table. The respectable, lower-middle-class family parlour has but a throw-rug rather than a larger carpet, and the picture conveys a strong suggestion of congestion as the figures seem hemmed in by furniture, including two tables and a cupboard, perhaps suggesting the narrow and constrained lives of the characters. Bentley, Nicholas, Michael Slater, and Nina Burgis. The Dickens: Index. Oxford: Oxford U. P., 1990. Davis, Paul. Charles Dickens A to Z. The Essential Reference to His Life and Work. New York: Checkmark and Facts On File, 1998. Dickens, Charles. The Adventures of Oliver Twist. Illustrated by George Cruikshank. London: Chapman and Hall, 1846. Dickens, Charles. "Miss Evans and The Eagle," Chapter 4 in "Characters," Sketches by Boz. Illustrated by George Cruikshank. London: Chapman and Hall, 1839; rpt., 1890. Pp. 170-174. Dickens, Charles. "Characters," Chapter 4, "Miss Evans and The Eagle," Christmas Books and Sketches by Boz, Illustrative of Every-day Life and Every-day People. Illustrated by Sol Eytinge, Jr. The Diamond Edition. Boston: James R. Osgood, 1875 [rpt. of 1867 Ticknor & Fields edition]. Pp.353-355. Dickens, Charles. "Miss Evans and The Eagle," Chapter 4 in "Characters," Sketches by Boz. Illustrated by Fred Barnard. The Household Edition. London: Chapman and Hall, 1876. Pp. 108-110. Dickens, Charles. "Miss Evans and The Eagle," Chapter 4 in "Characters," Sketches by Boz. Illustrated by Harry Furniss. The Charles Dickens Library Edition. London: Educational Book Company, 1910. Vol. 1. Pp. 219-223. Schlicke, Paul. "Sketches by Boz." Oxford Reader's Companion to Dickens. Oxford: Oxford U. P., 1999. Pp. 530-535.